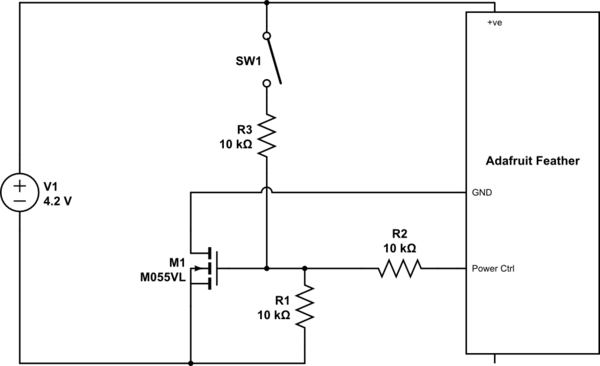 I am learning how to create a soft latch power switch, using an N channel mosfet. The idea is (so far) that I can turn it on with the switch, the Arduino immediately brings the power control high (ensuring the FET stays on), and brings that same pin low after 1.5s (simulating a timed shutdown). However; when the power control goes low, I still see about 1.8v in the power control line (I'm presuming its floating? ), which leaves this particular FET partially open. If I disconnect the power control line from the MCU, I get the behaviour I expect. I can touch the power control to +ve and the FET will switch on. If I lift the control line from +ve, the FET closes the gate, due to the pull down resistor. I'm struggling to understand why the FET works in isolation, but does not work when connected to the MCU output pin. The pinMode is OUTPUT. Here's the test code I'm using. It simply flashes a build in LED 10 times then does a power off. Your problem is that the GPIO pin is referenced to ground - and the MOSFET is isolating that ground. 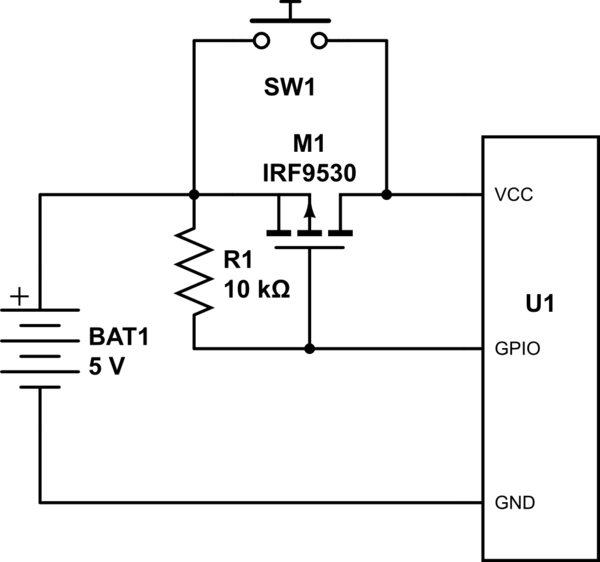 You need instead to switch the power not the ground - and for that, you use a P-channel MOSFET. To hold the power on you now set the GPIO LOW instead of HIGH. If you need to switch a higher voltage than the operating voltage of the MCU you will need to add another N-channel MOSFET to pull down the P-channel's gate. Not the answer you're looking for? Browse other questions tagged power adafruit mosfet or ask your own question. How to vibrate Adafruit Feather 32u4 Bluefruit LE device?